From that came the idea for a play about the ups and downs, the adventures and the characters of James Street North. He partnered with Ron Weihs and the play became a reality, performed at the Lyric Theatre. Now, an updated version, with more songs added, is on view at Artword Artbar, and it’s a keeper. I had the pleasure of seeing it at a very polished preview performance. Have you ever had the experience of finding a coffee-table book about Hamilton at a friend’s house, or at the library, and falling deeply into the pictures of the remarkable buildings of yesteryear; the classic cars lining the streets, and horses populating pictures of what is clearly your own city? It’s that wondrous feeling that resonates throughout this affectionate but not cloying production. A Hamilton Town Crier (Jeremy Shand) circa 1840, somehow travels through time and meets with a James Street North denizen -Charly Chiarelli in 2014. Their shared stories about James Street are played out in vignettes by the rest of the cast Paula Grove, Valeri Kay, Gordon Odegaard and Ryan Sero in word, song, and occasionally dance. It’s great fun,with the stories surprisingly informative (did you know that original settlers were given free land – no taxes? That Hamilton declared bankruptcy in 1866! The six-person ensemble brings to life several key moments of our city’s history. They show us scheming speculators George Hamilton and James Durand planning to create a town, and buying the support of Nathaniel Hughson by naming streets after his kids, Mary, Rebecca, and of course the aforementioned James. We see the surprising bankruptcy auction; visit some of the grand old shops, ride on a trolley, dance through Gore Park, witness race prejudice acknowledged by the chief of police, and tour the street with a proud immigrant from Sicily. 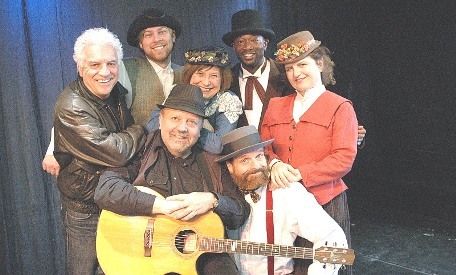 All this and more is supported by very enjoyable and era-appropriate music written by McNeil (“Jimmy Street”) on guitar and ukulele; Weihs on guitar and fiddle; Chiarelli playing harmonica; and the entire cast sings. An especially lovely musical moment was the Gore Park segment in which the several voices sang a barbershop-quartet-inspired piece. Hamilton’s ‘Eeyore’ phase has at long last passed. We now have a downtown where people want to be. It’s a lovely fact, and as we continue to embrace and take pride in our present we are able to enjoy, acknowledge and accept our past. This play has the ability to tell our story and to entertain us mightily at the same time. I recommend it to anyone who cares about this city.